Need big power and torque without breaking the bank? This turnkey Chevy 350 crate engine will give you everything you need to get your project car back out on the road. Chevrolet has been producing this engine since 1967 when they first dropped it in the Camaro. And now you can own a piece of muscle car history, too. Chevrolet has built their reputation on producing muscle cars that pack a punch and look good too. Some of the most popular American muscle cars have carried the Chevy 350 under their hood including the Camaro, Corvette, Nova and even the El Camino. Today, this engine is great for any pre-1976 vehicles or off-road project cars. Instead of rebuilding your current engine, this turnkey 350 crate engine is a brand-new block that features four-bolt mains. Just drop it in and go – no assembly required. If you’re looking for power, the 350 over delivers in almost every department. It is rated at 355 horsepower and has a whopping 405 lb-ft of torque. Many readers have used this engine in their Chevy project cars to get the power they crave, without having to worry about custom building their own power plant. One advantage of buying a turnkey crate engine is that is comes complete with all the goodies you’d have to pay a fortune to buy individually. These brand new aftermarket parts will give you the performance you need and they are guaranteed to work great together. Don’t waste your time chasing gremlins under the hood. Order a turnkey engine and get back out on the road. A few of the performance parts included are brand new high-flow aluminum heads, an aluminum intake manifold, HEI distributor, Holley four-barrel carburetor, front-accessory kit, starter, fuel pump, and spark plug wires. Almost everything you need to complete your project is included. Inside you’ll find a forged steel crankshaft, high-silicon pistons and a hydraulic roller camshaft. Other power-enhancers include 58-cc combustion chambers, 163-cc intake runners and raised exhaust ports. Plus, efficient 1.94/1.50-inch valves. When we say turnkey, we actually mean it. This engine also comes with a 12.75-inch externally balanced 153-tooth automatic transmission flexplate. However, if you have a manual transmission, you’ll need to change to an externally balanced flywheel. You will also need to provide a fuel line to get this baby running. 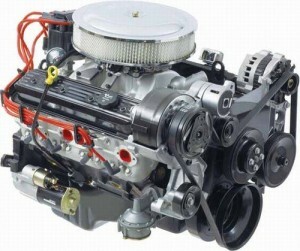 This 350 crate engine does not include a fuel line to connect the fuel pump to the carburetor. OK, so we both agree that this small block Chevy will give you all the horsepower you need at a great price. Now how do you get one delivered to your garage without spending an arm and a leg on freight shipping costs? It’s simple, really. I’ve combed the internet trying to find you the best shipping rates and I’ve finally found an irresistible deal. Click here to save hundreds. Overall, the ZZ4 Chevy crate engine is a winner in my book. With 355 horsepower right out of the box, there are few crate engines that deliver that level of performance at such an affordable price. Do yourself a favor and order one tonight. Then, send me an email with a photo when it arrives at your door.